This is what is known as the “Golden Rule”. If only we would stop, think and remember to use it. 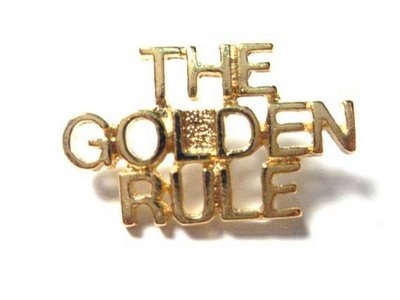 The majority of people believe in the Golden Rule, and have been taught it from toddler-hood. The problem is that we do not take that extra second to remember it when we are in a situation that we do not agree with, or have been hurt by. 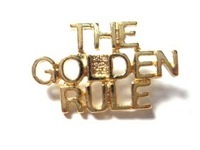 Can you imagine what the world would be like if we all used the Golden Rule? It does not mean that we would all agree with each other, but it does me that we would take the time to try to understand each other and treat each other as we would want to be treated in that same situation. Implementing the Golden Rule only can begin with each one of us. We need to think about how we want to be treated in each situation that we encounter. Even when the person we are encountering is incorrect we need to think about how they are feeling and how would we want to be treated if it were us and then treat them that way. The Golden Rule is about being ethical, and making ethical decisions in our daily lives. It is amazing how many people will opt to be unethical when they personally we be affected negatively in a situation. Many people believe that by embracing ethics it will limit their options, opportunities and their ability to succeed in life and in business. The result of this has been “ethical chaos”; everyone has his/her own standards. The result of this is whatever anyone wants to use as a standard is okay. People will naturally be easy on themselves and hold others to a higher standard judging them by their worst actions. As humans we seem to be susceptible to failing the ethic tests. Why do we do something even when we know it is wrong? We give ourselves permission to rationalize somehow that it is okay. We find it hard to make ethical choices in our life especially when the result of the choice will make us face something unpleasant. Even if it is the ethical choice many times we will choose to do something not so ethical to have a more pleasant outcome for ourselves. Return to the basics “treat others as you would want to be treated”. Examine your character, who are you really? Your character is your choice, you choose how you will act, believe; live out the person you are. Do you want to be valued? Then you must value others. Do want to be appreciated for who you are, what you do and stand for? Then appreciate others for who they are first. Do you want to be trusted? Trust is the foundation of all good relationships. You must earn trust and respect of others and the only way is to trust and respect others first. It starts with you. This entry was posted on Wednesday, November 5th, 2014 at 8:00 am by Tina Del Buono, PMAC. Filed under Business Improvement, Customer Service, Employee Management, Happiness, Leadership, Medical Practice Management, office management. You can follow any responses to this entry through the RSS 2.0 feed. Both comments and pings are currently closed.